Up next for release this week, we have one of the most requested nootropic ingredients today, Alpha-GPC. Nootropics are a class of ingredients that help to improve brain function, mental acuity, and memory. This category has become incredibly popular over the past couple of years due to their ability to enhance one’s productivity, energy and ability to focus in on completing tasks. This makes them the perfect fit for everyone ranging from your everyday busy business professional to your high-level competitive athlete. 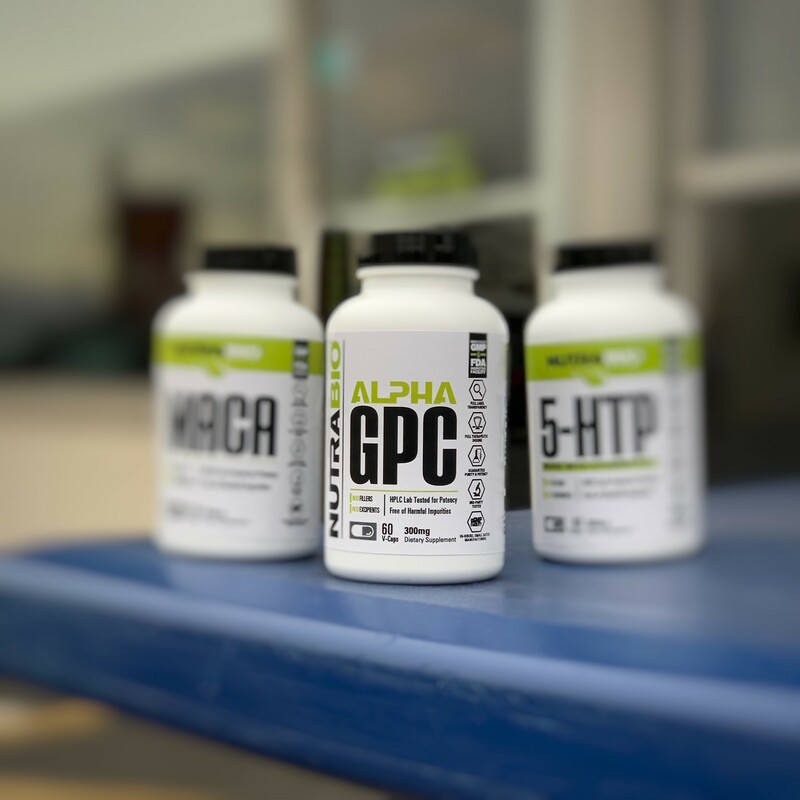 Alpha-GPC is a choline-based supplement that crosses the blood-brain barrier which increases it’s bioavailability and absorption as compared to other choline-containing supplements, making it the preferred source of choline on the market today. Alpha-GPC also has a variety of benefits and effects that make it useful for anyone. Alpha-GPC usage promotes enhanced cognition, increases power output, improves memory recall and has neuroprotective properties which may aid in cognitive aging decline. The best part about all these effects is that Alpha-GPC is non-stimulatory which makes it the ideal addition to any stimulant based or non-stimulant based stack of your choice and goes well with products like our PRE, PRE Extreme, PRE Stim-Free and ThermoFuel. NutraBio Alpha-GPC contains an industry leading dosage of 300 mg per capsule which is the clinical dose used in the studies that showed an increase in power output and athletic performance. So if you’re looking for a supplement to help bring your mental and physical performance to the next level, look no further than NutraBio Alpha-GPC. Do you intend to release this product in powder form? I hate that I have to buy my supplements from various providers because you sell some in powdered form, but others, such as this as capsules only. I used to buy supplements as capsules and break them open to put into my shakes, but thanks to the internet, the world market is open to us consumers. Please compete and offer the products that we want. In the form/s that we want. LONG time NutraBio customer, and competitive athlete. Website shows 300mg per capsule.